HTTPS is HTTP over TLS. It allows you to encrypt traffic to and from your web server, providing privacy and security for your clients. As of this writing, the world is moving ever closer to HTTPS everywhere: thanks to the Snowden documents, there’s been a big push for more privacy and security. Major companies like Google and Mozilla are securing traffic by default for all their applications. Cloudflare is offering free HTTPS encryption between clients and their severs. Let’sEncrypt, a new Certificate Authority offering free, secure certificates is scheduled to open it’s doors in September. If you run a webserver, you should be offering HTTPS, and perhaps even forcing HTTPS-only traffic. This article is about how to configure Apache for HTTPS authentication, supporting modern cipher suites and TLS protocols. The goal is an “A” rating by the SSLLabs test (https://www.ssllabs.com/ssltest/index.html). Note: These are recommended HTTPS configurations as of June 2015. If you’re reading this more than six months later, it’s almost certainly out of date. There are four categories to the SSLLabs test: Certificate, Protocol Support, Key Exchange, Cipher Strength. We’ll cover best practices for each in order. Most of the certificate configuration information is relatively well known. I’ve included it for completeness if you want or need to read it in Appendix 3: General Certificate Information. This can be added to your SSL configuration file (/etc/httpd/conf.d/ssl.conf on Red Hat-based systems), or individual Virtual Hosts if they have their own separate SSL configurations. Protocol Support is relatively straightforward. Each TLS Protocol describes how the cryptographic algorithms are used between the client and the server. As time has gone by, some of these protocols have been found to be insecure, so in order to protect your data in transit, and also receive a good score on the SSLLabs test, you must enable the “good” protocols and disable the insecure ones. This enables TLS versions 1.0, 1.1 and 1.2, and disables the known-insecure SSLv2 and SSLv3 protocols. Note: It’s possible to get a higher score on the SSLLabs test, and remove the slightly less secure TLS 1.0 protocol by changing +TLSv1 to -TLSv1. However, as of June 2015, about 30% of browsers out there still support only TLS 1.0, namely Android < 4.4, and IE < 11. This means users with those browsers will be unable to connect to your server if you disable TLS 1.0. Hopefully the use of those older browsers will be reduced quickly. The best way to get a good score for the Key Exchange category and add security to your HTTPS connection is to use a key with a length of at least 4096 bits, not allow anonymous key exchange and not use a weak (Debian OpenSSL flaw) key. This is easy. Generate your key with 4096 bits. If you’re doing it manually, with the OpenSSL command, you’d simply specify 4096 as the key length. This is an older bug in Debian’s OpenSSL package. If you’re using a Debian-based system, update to the latest OpenSSL package before generating your key, and you’re good to go. There are dozens of Ciphers supported by the OpenSSL packages. In order to secure your traffic, you should enable only the most secure ciphers available in your OpenSSL package. The easiest way to get a list of trusted ciphers is to follow Mozilla.org’s recommendations for the Modern Compatibility Cipher Suites (https://wiki.mozilla.org/Security/Server_Side_TLS#Modern_compatibility). This supports the majority of modern browsers. As with the SSLProtocol above, you can take it a step further and remove some of the less secure ciphers from this list to get a better score and better protect your traffic, but a larger portion of browsers will be unable to connect to your server. If you’ve already disabled TLS 1.0, then that may not be an issue for you. This information covers the basic configurations for setting up an Apache server with HTTPS support, and making sure it’s acceptably secure. Using insecure HTTPS settings is effectively just as bad as using no HTTPS – maybe more so if you lull your clients into a false sense of security – so making sure you stay up-to-date with vulnerabilities is extremely important. As mentioned previously, this is valid as of June 2015. The older this article gets, the more out of date these recommendations are. By 2016, you should probably verify the information here to make sure it’s accurate. Another beneficial security, and one required for an “A” grade from SSLLabs, is Perfect Forward Secrecy (PFS). PFS is a protocol that protects data transmission in the event that one of the keys used is compromised in the future. (Check the “Further Reading” section for more specific details). If your version of OpenSSL does not support the more secure ciphers, this will not break anything – they just will not be used. However, your server will not support Perfect Forward Secrecy either. Server Name Indication (SNI) is an extension of the TLS protocol that allows a client to send a request to the server that informs the server of the hostname the browser is attempting to connect to, without the server having to find a TLS key with which to decrypt the traffic first. Before SNI, there was no way to differentiate what host the client was attempting to connect to before the TLS decryption occurred, so Apache could not tell which host to direct traffic to. This meant each HTTPS enabled site had to have it’s own IP address, so traffic was routed via IP instead. Functionally, this allows Apache to host more than a single HTTPS enabled site per IP address. If you are using SNI, it’s worth noting that SSLLabs does a check for “Incorrect SNI Alerts”. These alerts are sent by the server if an SNI-enabled server sends a certificate which contains Subject or Subject Alternative Names for which the server or or it’s virtual hosts are not configured. For example: If your certificate included “www.example.org” and “example.org”, and was used with a Virtual Host with no ServerName or ServerAlias directives setup for “www.example.org” or “example.org”, this would trigger the “Incorrect SNI Alert”. The same thing would happen if your host was configured with a ServerName for just one of the two Subject names included in the certificate. 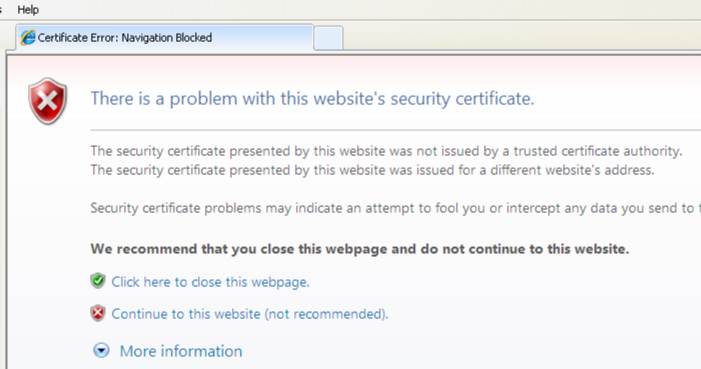 Note: This is not the same thing as the certificate not matching the domain. That is a separate issue, and discussed in Appendix 3: General Certificate Information. To fix Incorrect SNI Alerts, the Virtual Host or server responding to the SSL request MUST have the ServerName directive set for the primary Subject name, and ServerAlias directives for ALL of the other Subject Alternative Names in the certificate. This simply means you must use a certificate that matches your domain name. A certificate for “example.org” does NOT match the “www.example.org” domain, and vice versa. A certificate CAN have multiple subjects, through the use of Subject Alternative Names, so your cert can include both “example.org” and “www.example.org”, or more. This is easy. When you get a cert, it will be valid for a specific period of time. Chances are it won’t be valid starting in the future, so you’re OK there. As long as you replace it with a new one before it expires, and don’t use a certificate that’s been revoked, that should cover the rest. Your Certificate Authority should sign your certificate with a secure signature (not MD2 or MD5, etc). If they do not, find another CA. This removes both SSLv2 and SSLv3 (both are known to have vulnerabilities), and relies on TLS. This is good. If you receive a handshake error, you’re good. No SSLv3 for you. If you receive certificates and other info back, then SSLv3 is enabled, and you should change that. Change the port if you want to check a different service (mail, etc). Removing SSLv3 does remove a protocol that older browsers may use to connect to your server. It’s most likely to impact unpatched version of IE6, or browsers on old mobile devices. In practice, it has been an extremely small segment of our base (it appears to be < 0.1%) or so. Of course, analyze your client base to see for sure. Server Name Indication, or SNI, is an extension to the TLS protocol. It’s function, in plain English, is to allow a browser to tell a web serverwhich website it’s coming to see before starting the SSL connection. The browser then knows which SSL credentials to send back to the browser and an SSL connection can be established. SNI is supported by all modern browsers. In fact, it’s even supported by a ton of positively ancient browsers. It’s not, however, supported by any version of Internet Explorer on Windows XP. If you see an error like the one below, and you are using Internet Explorer on Windows XP, please, take it seriously. Don’t click through. But DO get a REAL browser, like Firefox or Chrome and use that instead, for everything you do . You should ideally upgrade to a newer version of Windows if you’re still on XP. You’re not getting any patches. You will get hacked. It’s not a question of if. It’s not even a question of when. You probably already have been. But I know that’s not feasible for everyone. A couple of stats for you. Only 5.29% of the entire internet is still using IE8. IE7 holds their impressive 0.17%, and IE6 is actually 0.3%. All together, those three make up 5.76% of the internet. The take home from all of this? The rest of the world has moved on, and you should too. Use Firefox or Chrome. Just do it.